Laura: This is Census Bureau numbers - There are 300,000 children who are born in the U.S. each year, neither parent an American citizen. What's your reaction to that? Kasich: Well, I mean, we have laws here that say that if you're born here in America you become a citizen. Laura: There's actually no law that says that. There's no law that says that. As students of the Constitution fully know there is no birthright citizenship clause in the Constitution whereby foreign pregnant women selfishly travel to America to deliberately give birth in America to a child who automatically becomes a U.S. citizen. 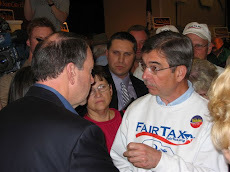 But there is a forty year abuse where the enemies of America, both foreign & domestic, have misused & purposely mistaught in schools the history & meaning of the 14th Amendment so that foreigners can latch on to every government benefit & program imaginable thereby making fools out of us all. Kasich, a well known, leading, life long politician, demonstrates his woeful understanding of the Constitution in this regard by his statement in the above interview. The 14th Amendment was designed to give citizenship to freed slaves – not people from foreign lands who plan to take advantage of America's generosity – this is the subject absurdity - that the children of illegal immigrants become citizens entitled to benefits as a direct result of their parents willfully, deliberately, & purposely breaking our laws. Awarding citizenship to children of lawbreakers defies common sense & is insulting - the Constitution was never meant to be a suicide pact. What does the mother country that is the original home of the illegal immigrant parents say about this – does this mother country regard the children of these parents as citizens of that country? Senator Jacob Howard worked closely with President Lincoln in writing the 13th Amendment which abolished slavery & served on the Joint Committee on Reconstruction & was the author of the key phrase "subject to the jurisdiction thereof" in the 14th Amendment. Howard explained that this phrase was included in the 14th Amendment to exclude foreigners, aliens, & children of ambassadors or foreign ministers because these people did not have exclusive full political allegiance to the U.S. – something that is required for citizenship. 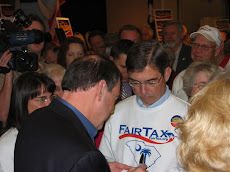 Accordingly, the 14th Amendment does not apply to foreigners who do not come under American jurisdiction – like foreign couples, neither of whom are American citizens, whose sole plan is to practice "birth tourism" – the insidious intent to give birth in the U.S. in order to fallaciously secure U.S. citizenship for a child who becomes an anchor baby, i.e., the ticket for all the child's family members, under chain migration, to move to the U.S. with benefits for all – well ahead of people who have thoroughly followed immigration laws. Professor John C. Eastman, Chapman University School Of Law, has written & taught on the fallacy of birthright citizenship for children of illegal immigrants. Professor Eastman explains that the "subject to the jurisdiction thereof" clause of the 14th Amendment was modeled after a clause of the 1866 Civil Rights Act that was passed to enfranchise previously enslaved black Americans. The act stated that "All persons born or naturalized in the United States, & not subject to any foreign power, excluding Indians not taxed, are hereby declared to be citizens of the United States." Professor Eastman teaches that the 1866 Civil Rights Act & the 14th Amendment precludes birthright citizenship for children of temporary visitors or parents who are here illegally. Case in point regarding children born to parents who are here illegally: the photo below shows Maryury Elizabeth Serrano-Hernandez, a 19 year old, 9 month pregnant woman from Honduras, climbing the border fence in Tijuana, & less than 24 hours later, after setting foot on American soil, giving birth to a baby boy who is claimed to be as American as you are. Trump plans to build a more secure wall than the one shown in the photo. As Laura Ingraham mentioned in the Kasich interview above there are 300,000 children born each year to parents who are either in the country illegally or traveled on visas to give birth (birth tourism) on U.S. soil – with neither parent being an American citizen in either case. These children have been granted automatic citizenship. There are currently 4.7 million anchor babies in the U.S. who are under the age of 18 plus millions more who are over 18. About 7% of the total 4 million births in the U.S. were born to illegal immigrant parents in 2014. The Pew organization has determined that there are also 725,000 children younger than 18 who were illegal immigrants themselves & lived with illegal immigrant parents. These totals do not include U.S.-born children of illegal immigrants who do not live with their parents. Estimates of total illegal immigrants living in the U.S. range from 11 million to 22 million. Accordingly, this has been a southwest border crisis for decades that no one ever addressed. During the last 30 years the rate of illegal immigrants coming to America has ranged from 304,000 in fiscal year (FY) 2017 to 1.6 million in FY 2000 (based on apprehensions @ the southwest border) – both numbers are huge when you realize the lower number equates to 832 apprehensions each day. 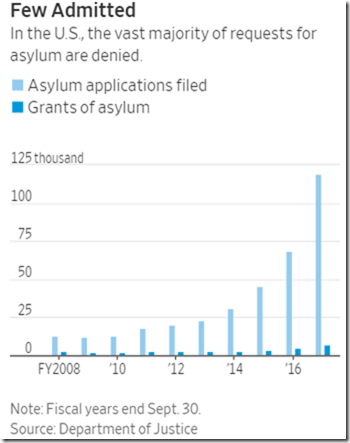 But the disturbing trend that President Trump identifies as an emergency is the exponential rate of growth of the number of migrants seeking asylum. 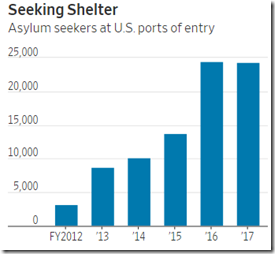 See graphic below from the WSJ that shows the number of asylum seekers @ U.S. ports of entry increased from 3,192 in FY 2012 to 24,377 in FY 2017 – a 660% increase. But the problem is much worse than shown on the above graphic which counts only asylum seekers @ ports of entry. 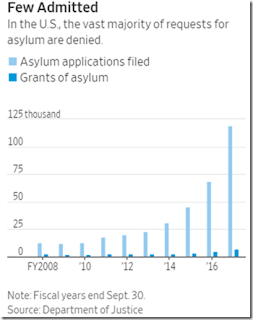 There was a total of 78,564 requests for asylum in FY 2016 up from 13,880 in FY 2012. In FY 2017 there was 99,035 total requests for asylum including 62,609 from Guatemala, Honduras, & El Salvador – the three countries whose people make up the vast majority of the population of the caravans travelling across Mexico to America's southwest border. But there is more to the numbers than meets the eye. In years past the vast majority of those apprehended @ the border were Mexicans who were handed over to ICE & deported. Currently over half of border apprehensions are Central American children or families. Thanks to Congress writing a 2008 trafficking law Central American children cannot be immediately deported in accordance with the law because they are not from Mexico or Canada – our two contiguous neighbors. U.S. Border Patrol Chief Carla Provost testified earlier this week to the House Judiciary Committee that these demographic changes have stretched her agency thin saying "Each day, nearly 25% of my agents are diverted away from our border security mission to care for, transport, & process family members & unaccompanied children. We know that when agents are occupied, narcotic smugglers, criminal aliens, gang members, & others use the opportunity to violate our borders & our laws." And violate our laws they do. These migrants know the loopholes in the laws backward & forward. Migrants travelling in caravan after caravan, 12,000 people @ a time, have learned that if they can put one foot on American soil & say the word "asylum" to a border guard they will begin the process in which they take advantage of our immigration laws that President Trump has called the worst in the world regarding having the best interest of their own citizens – namely us. And maybe worst of all, as many as 94.1% of the migrants pretending to seek asylum know they don't qualify for asylum – see previous posts for details. These people forcibly pushed through both the Honduras-Guatemala border & the Guatemala-Mexico border, overwhelmed Mexican police, stormed the San Ysidro Land Port Of Entry between San Diego & Tijuana throwing rocks @ U.S. border guards – while all the time defiantly waving flags of other countries. These migrants have learned to use our immigration laws & values as weapons against us & it will continue nonstop until Congress changes our immigration laws. This is the invasion; this is the emergency; & a border wall, definitely needed in the overall scheme of things, that won't be erected for years if it started construction today, is not the answer to this emergency. Something swifter – an act of Congress changing our immigration laws is required. Asking for help from Congress is farfetched unless the citizenry understands the stakes for them. Just look how fast Democrat positions on virtually every issue has moved in the socialist direction away from liberty in just the past very few years – Medicare for All, free college, guaranteed jobs, a Green New Deal that will fundamentally change your way of life, infanticide not just abortion, elimination of ICE, & on & on. With regard to the topic @ hand Democrat positions on birthright citizenship & the handling of illegal immigrants has changed also. Click here to hear former Senate Majority Leader Harry Reid explain that no sane country would allow birthright citizenship to children of lawbreakers; & here to hear Hillary Clinton explain that illegal immigrant children should be sent back to their home country. These former positions of Ringside Reid & Hillary are precisely the same as President Trump's today. How wonderful it would be if politicians would only do what was best for America - & letting everyone who wants to come to America, when they feel like it, for their own reasons, is not best for America. Congress, your elected representatives in the federal government, could put an end to the birthright citizenship claim of children of illegal immigrants & all the other invasion abuses @ our southwest border & people overstaying visas through the Naturalization clause of the Constitution - Article I, Section 8, Clause 4 – under the power "To establish a uniform Rule of Naturalization." 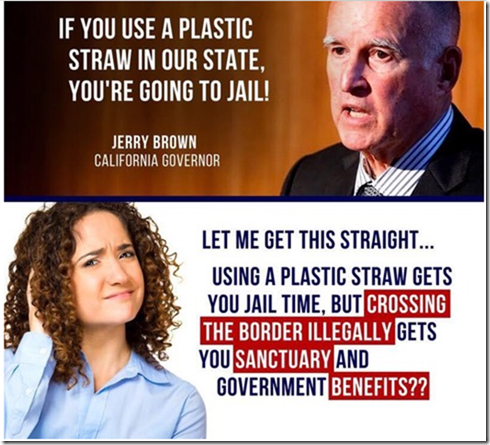 Congress is the only one constitutionally charged in this regard so they are the only ones who can really fix the immigration problem if current laws are being abused. And don't be fooled into thinking a constitutional amendment is necessary because Section 5 of the 14th Amendment was tailor written to avoid this: "The Congress shall have the power to enforce, by appropriate legislation, the provisions of this article" meaning that the birthright citizenship abuse detailed above can be stopped by congressional legislation as specified in the Constitution. 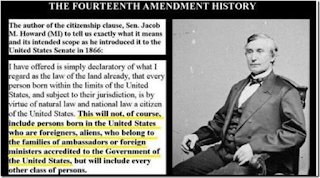 And the most practical point of all reveals the biggest absurdity: we should not be tricked into thinking that the birthright citizenship clause of the 14th Amendment, ratified on July 9, 1868, applies to illegal immigrants. The 14th Amendment was written before anyone knew what an "illegal immigrant" was. Thanks to PB, an "A" grade quiz taker who has a nearly perfect score answering all the quizzes over the years, for recently sending the subject quiz below. Naturally I held my breath waiting for PB to let me know whether or not I was able to figure the riddle out. I was quite relieved when I received the message "
Doug, Congratulations, you got it." Three men are captured by cannibals in the jungle. The cannibals decide to give the men one chance to escape with their lives. They bind the men to stakes in such a way that one man can see the backs of the other two, the middle man can see the back of the front man, and the front man cannot see anybody. The cannibals show the men five hats. Three of them are black; the other two are white. Then they blindfold the men and place one of the hats on each man's head, hiding the two remaining hats. After removing the blindfolds, the cannibals tell the men that if one of them can guess what color hat he's wearing, they can all go free. Time passes. Finally, the front man, who can't see anyone, correctly guesses the color of his hat. What color was the hat? How did he know? The map below shows the location of fencing prior & post 2007. 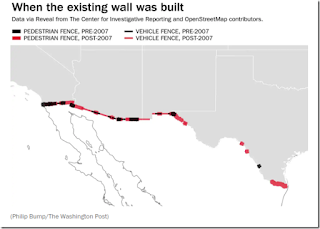 The feeble argument being that the aforementioned three senators were for the red lines on the map because there were so many open miles for entry into the U.S. in 2006 – like there are not many now? Why not finish the job then or most definitely now? Poor excuse. Now there are differences in walls, fences, & barriers – but whatever you call it Trump wants to build a better one than shown in San Diego below. House Speaker Nancy Pelosi did not support the Secure Fence Act of 2006 but she was on board supporting barriers with the Senate Gang of Eight legislation that passed the Senate in 2013 but never came to a House vote in the GOP controlled chamber. Congress passed southern border barrier protection legislation, with Pelosi's support, for $1.6 billion in both 2017 & 2018 – 40 miles of replacement fencing in 2017 & 33 miles of levee wall & pedestrian fencing in the Rio Grande Valley in 2018. The House also passed $1.3 billion a few weeks ago that is waiting for Senate approval. It is stipulated in all this legislation that concrete was a material forbidden to be used in this work. 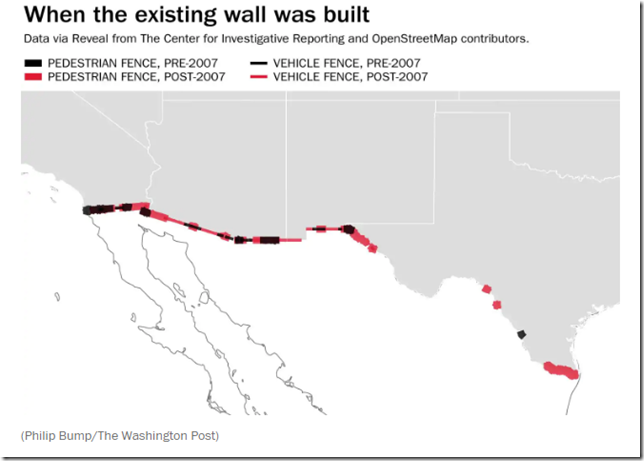 Trump is seeking congressional approval for $5.7 billion to build about 234 miles of physical barriers that would strategically fill in some of the unprotected open spaces shown in the above map & accordingly aid the border patrol's work. Pelosi & Schumer have vowed to not fund the physical barrier that Trump campaigned on - this fight over such a small current budget amount, that partially shut the government down for 35 days, becomes even smaller when you take into account that the physical barrier will have a useful life of @ least twenty years. Democrats have also disagreed with the recommendations of Customs & Border Protection (CBP) on where any wall should be placed. Evidently this degree of detail is within Democrats pay grade. In summary, Democrats have currently voted to maintain existing physical barriers & have previously supported new physical barriers – just not the new one that Trump & the CBP prefer. Pelosi calls walls immoral but there have been no calls to tear down existing walls – so existing ones are not that immoral. 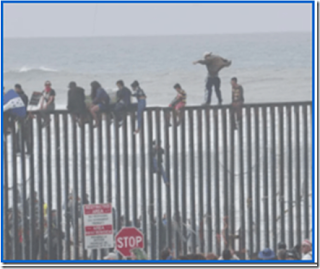 Worse yet, click here to see Tucker Carlson provide a list of walls that Democrats do not find immoral – these are the walls that protect them personally. 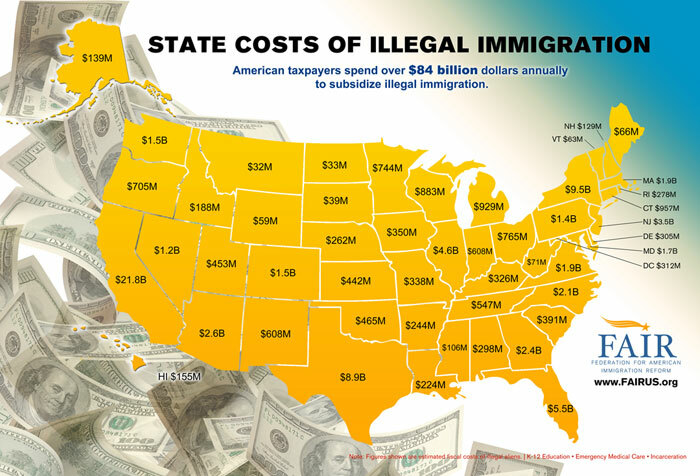 The total cost of illegal immigration is $113 billion a year @ the combined federal, state, & local levels – with $84 billion borne by state & local taxpayers (see map below). Sixty three percent of households headed by a non-citizen used @ least one welfare program in 2014 – source Center For Immigration Studies. The major welfare programs used include Supplemental Security Income (SSI), Temporary Assistance to Needy Families (TANF), the Women, Infants, & Children (WIC) food program, free or subsidized school lunch & breakfast, food stamps (officially called the Supplemental Nutrition Assistance Program or SNAP), Medicaid, public housing, & rent subsidies. In short, we are being made fools of. Democrats see Democrat voters in all the people in the caravans with the U.S. citizenry paying the price including the country giving up its sovereignty. I recently received a note from a very wise reader who told me "there is such hostility & hatred of Trump, it seems what happens to the U.S. is unimportant to Democrats & many Americans." That is precisely what this post, the partial government shutdown, the border wall fight, & Democrats not knowing when to stand & cheer when they hear great news @ the State of the Union address is all about. If it makes Trump look good Democrats are against it - & you.